Moscow, November 14, 1991. The 58th USSR Championship has just finished and there is a glittering prize distribution ceremony. Players and spectators are exchanging bonhomie even as music is played. Amidst all this festivity you see an old man perched on a chair. He sits motionless, lost in a reverie. When had he played like these boys? 35 years ago! He was only 20 and already crossing swords with Averbakh, Boleslavsky and Ragozin, not to mention his own peers, Korchnoi, Spassky and Polugaevsky. Here in this Championship, his performance is nothing to write home about. In a field of 64 players, he has shared 39th to 49th places and the score, 5/11 (+1 -2 =8)! Yet he would not have missed it for anything in the world. He has delighted in the play of the young, commiserated with the old, never complaining about anything. A stunning performance that reminds the old man of his own younger days! He who had once won this USSR Championship as many as six times now revels in the sights and sounds of these new battles, never mind his own result. Together with friend and companion, Vaganian he also writes a report on the championship for New in Chess Magazine recreating the whole drama of the tournament. The old man, as the readers guessed, is Misha Tal. It’s with regret that I put the rest of the narrative in the past tense. On January 1, 1992, the Soviet Union ceased to exist. It was preceded and followed by a turmoil never known before or since. Amidst this chaos, Misha moved to Germany with his wife and daughter. An ardent fan had provided him and the family a house for free. But Misha’s heart belonged to Riga and Moscow. He would return to Moscow every now and then for medical tests. In the summer of 1992, he was again admitted to hospital. This time was a game of dice with Death itself. He who had forever gambled with life now found himself on the brink of defeat. His restless spirit still yearned for chess. On this DVD a team of experts gets to the bottom of Kasparov's play. In over 8 hours of video running time the authors Rogozenko, Marin, Reeh and Müller cast light on four important aspects of Kasparov's play: opening, strategy, tactics and endgame. That was his last bow. By then his condition had deteriorated. Slowly he lost his consciousness and life ebbed away from his frail body. Over the years it had submitted to every impossible demand that his indomitable will had made on it and now could not take it any more. He breathed his last on July 28th, 1992. Kirillov had lost his friend and idol. Even in that moment of shock and grief, he did not lose his sense of responsibility. It’s a token of his integrity that both wives of Tal and the children reposed their faith in him for making the final arrangements for Misha’s burial in Riga. It did not end there. He devoted the rest of his life to prepare a complete collection of Tal’s games. The chess world owes a debt to him for preserving the legacy of Tal. Tal was a bit of pushover. He was powerless off the board. He would let soviet chess administrators boss him around. You could say they wound up outplaying him. In this book, Kirillov makes a brave attempt to defend his departed friend against such criticism. He maintains, Tal made no more compromises than necessary. It was just a way of survival in the system. Anyone who defied it paid the price and ran the risk of becoming a nobody shunned by everyone. The black-and-white images take up a great deal of space in the book. Many of them are worth it. They have not been seen before. This brings me to the limitations of the book. The title is a bit of misnomer. Essentially, this is a Kirillov story. In this context, the writing on other players Janis Klovans and Aivars Gipslis appears rather superfluous. The same cannot be said of Alvins Vītoliņš who adored Tal and took after him in style. So he certainly deserves his place in this book. We have now reached the end of our journey. Kirillov could bring himself to write this work only in his last days. By then he was critically ill and the task was by no means easy. However, after much persuasion by Alexei Shirov, he was able to write these reminiscences of Tal. In a way that explains the uneven quality of writing (often one has to wade through a rambling narrative that moves back and forth). On occasion the writing is pedestrian. A case in point is his description of the Riga Interzonal 1979 that Tal won. A more illuminating story is provided by Kapengut [in Russian] who acted as Tal’s second for this tournament. (The English version had first appeared in New in Chess Magazine, 2007/1). This little book offers quite a few signposts for Tal fans to follow. The discerning reader would do well to reflect on the pauses and the gaps that Kirillov did not wish to fill in. He was a loyal friend, after all. I owe a special debt to Mr.Raymond W. Rozman, Special Collections Librarian, Cleveland Public Library, USA. He offered a pdf copy of the report on the 1991 USSR Championship by Tal and Vaganian that appeared in New in Chess Magazine, issue, 1992/2. Late Rimma Bilunova (1940-2015) was a coach of women's team for years during the Soviet era. She prepared the card index for the Central Chess Club, Moscow. Here is an interview with her. The USSR championship 1991 was the last of them all. Once the Soviet Union ceased to exist it was also discontinued. Emanuel Sztein (1934-1999) was an émigré author, publisher and collector of rare books and manuscripts. 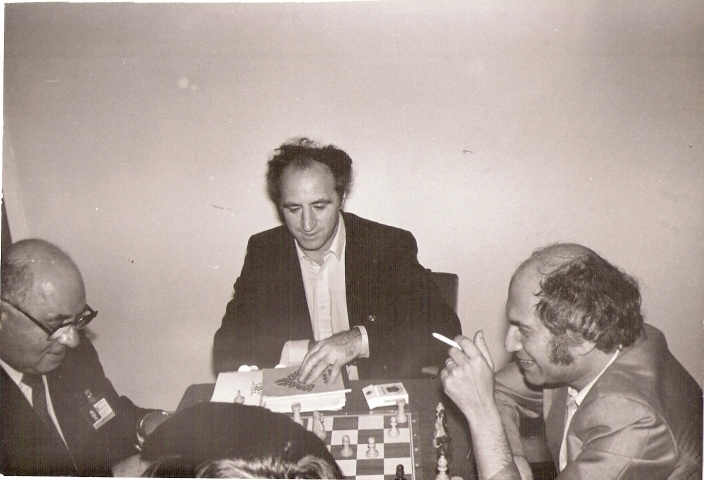 He had served as a press attaché for Korchnoi, during the World Championship Match with Karpov (1980). His article, critical of Tal appeared in шахматный вестник (Chess Herald) No.1, 1993. Tal was known as the Devil of the Chessboard. The printer’s devil did not wish to be behind. So it also leaves its occasional mark on this book. The Leningrad Interzonal was played in 1973 and not 1972. Both Emanuel Sztein and Galina Satonina have their names misspelt. Otherwise, the text remains clean. Nagesh Havanur Prof. Nagesh Havanur (otherwise known as "chessbibliophile") is a senior academic and research scholar. He taught English in Mumbai for three decades and has now settled in Bangalore, India. His interests include chess history, biography and opening theory. He has been writing on the Royal Game for more than two decades. His articles and reviews have appeared on several web sites and magazines. Marselos, it's both a board game and a dice game. "The board game they are playing, which might be compared to a backgammon or checkers variant, was played with a die." - Wikipedia, Exekias. The reference to the game 'checkers' is probably a mistake; backgammon counters being known as 'checkers'. @Frits Fritschy , this vase represents a board game, it is in the Vatican, of course modern chess is later, chess represents the medieval society. Misha Tal was hardly the master of sacrifice. Though it is true his games contain much sacrifice as a matter of style and routine. His own comments contain the truth of his approach to chess; "there are correct sacrifices and there are mine". The time of Tal has past, long live the genius! While the period around the formal end of the USSR was tumultuous, I'm fairly certain that the turmoil during the Revolution, the Famine, the Terror, and WWII was worse. Honestly, I have never appreciated his style of life and of play. I do not recommend it to a student. But, this world champion, with his demonic strength, remains the supreme master of sacrifice.